Determining the amount for payment of spousal and child support are based on a number of factors including but not limited to net and gross income, earning capacity and taxes. Under PA law, child and spousal support are calculated according to a specific set of guidelines, which is based largely on the monthly net incomes and earning capacities of the parties. The guidelines are intended to create consistency among similarly situated families. For purposes of calculating child and spousal support, monthly net income is gross income (which includes income from any source) subtracted by required taxes, involuntary retirement payments, union dues, and alimony paid to the other party. Child and spousal support litigants are often surprised to find that many deductions that are taken out of their paychecks, such as contributions to a 401(k) plan or life insurance offered through their employer, are not allowable deductions for purposes of calculating child and spousal support obligations. Certain other deviations are allowed, however. For instance, if the person who is paying child support (obligor) has physical custody of the child/children overnight at least 40% of the time, they are entitled to a shared custody deviation from the guidelines. Other deviations may be allowed if the obligor or the obligee (the person who receives support) has any unusual needs or extraordinary expenses. Although the obligor is usually required to cover the children and the obligee (if they are still married) on health insurance if it is available at a reasonable cost, the cost is taken into account in setting an obligation. Child and spousal support is usually based on what the litigants actually earn, but when there is no paycheck or W-2 from which their income can be determined, they may be assessed with an earning capacity. This is often the case for people who are self-employed, have fluctuating income, or people who have been fired for cause from a job. In making a determination of earning capacity, the trier of fact considers many factors, such as the work history, education, and childcare responsibilities of that particular person. For instance, if a child support obligor was fired from a job for cause (or quit a job), the child and/or spousal support obligation may be calculated giving that person an earning capacity similar to what they previously earned. Sometimes one of the parties does not work outside the home in order to take care of children. If the children are of school age, it is quite possible that they will be assessed with an earning capacity consistent with their education, skills, or income earned from previous employment. Child support ends at age 18, or upon graduation from high school, or emancipation, whichever is last. PA courts will not impose an obligation to pay support for college students, although they will enforce written out-of-court agreements to pay college support. After a husband and wife have separated, but before a divorce is filed, the lesser earning spouse can file for spousal support. Like child support, spousal support is based on the guidelines, but relatively simpler to calculate once the net incomes or earning capacities of the parties have been determined. Where there are no children, spousal support is 40% of the difference in the parties’ net incomes or earning capacities. If there are children, the child support obligation is first subtracted from the parties’ combined net incomes, and then the spousal support is 30% of the difference. In a spousal support case only, the obligor may allege some “entitlement” defenses in defending a claim for spousal support, however. For instance, the obligor could argue that the obligee is not entitled to spousal support because the obligee was unfaithful, or there was some instance of fraud. Unskilled or lesser-experienced support lawyers may fail to raise these defenses. The law requires that both parties notify the court (and the other party to a support order) within 7 days if there is any change in their addresses, their employment, or any other change in circumstances related to the level of support, or the administration of the support order. If your support order is several years old, or if any of the children became emancipated, it is likely that the order should be modified. You should speak to your lawyer first, however, to make sure your current income makes it advisable to seek modification. 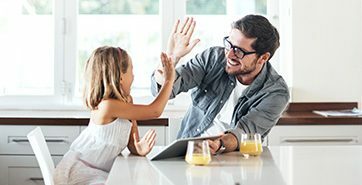 We at Shah Law Group have up-to-date information about child and spousal support guidelines, including computer software programs which enables us to calculate support obligations quickly and efficiently; if you give us accurate income information, we can calculate a support obligation during your initial consultation with our firm, and determine whether any deviations are appropriate. There are free child support calculators online, but they cannot effectively evaluate the special circumstances of each particular case. A free online child support calculator is not a substitute for an experienced child and spousal support lawyer.